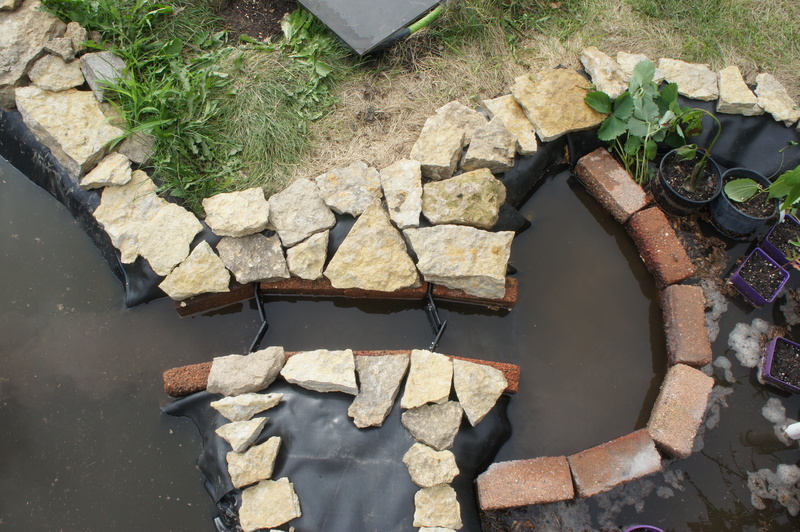 Part 1 of this project covered some initial construction of our garden pond. Now it’s time for some photos with water! The pond and swamp pool take quite a bit of water to fill! I haven’t calculated the exact volume, but between the 300gal and 150gal stock tanks, plus liner extensions, and minus filter media, I’m guessing we’re in the ballpark of 500 gallons. We’re trying to avoid any chemicals to that might stress the fish, so most of the water comes from our rain barrels. According to various websites, moving water loses about 0.5-1% per day of the total gallons pumped per hour, so we’ll have to occasionally top this off to maintain the water level. We’re pumping 1000gph so can expect to lose something like 5-10 gallons per day to evaporation. Another way to calculate water loss is based on an archaic government-issue kiddie pool. It’s all a bit fuzzy and dependent on surface area, cloud cover, and humidity, but after eliminating any detectable leaks we’ve noticed water loss consistent-ish with both these measurements (about 5-10 gallons per day). The smaller swamp filter pond is a little higher in elevation than the main fish pond. 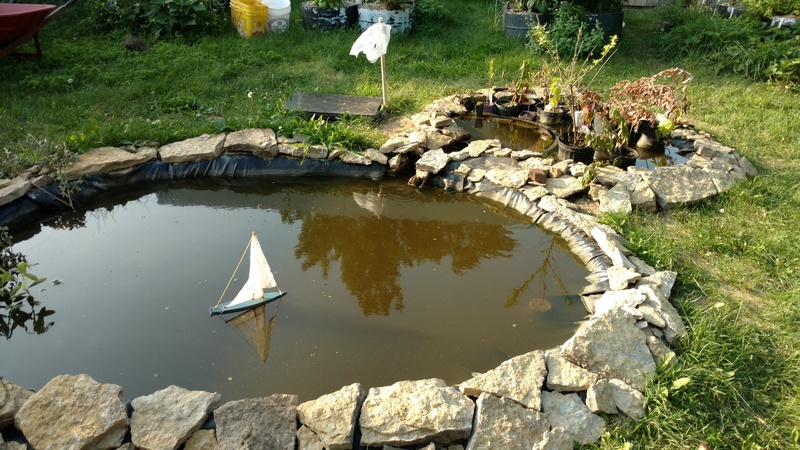 As mentioned previously, “dirty” water gets pumped from the fish pond into the bottom of the swamp, where it percolates up through gravel, screen, and mud. 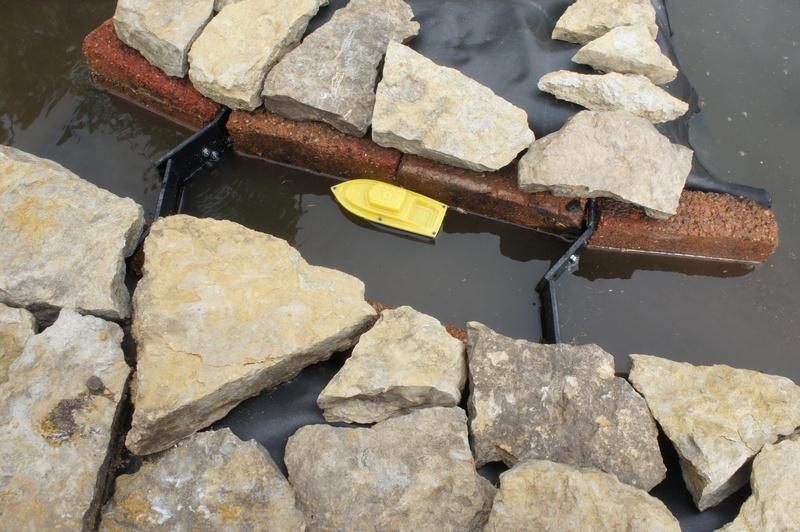 To get the filtered water back down, I could have done a stream or waterfall, but decided to do a canal instead. Naturally a canal needs a set of lock gates to allow boat navigation between the different water levels! The lock gates are hand-operated, and work pretty well. They aren’t particularly watertight, so enough turbulence and splashing develops to help aerate the water. 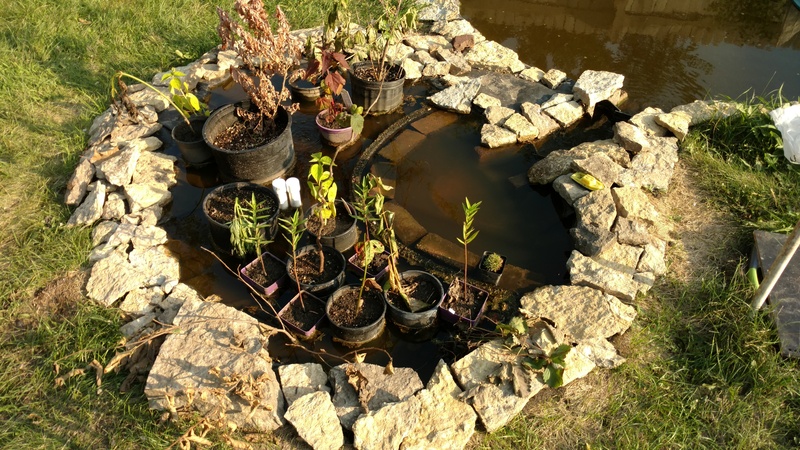 The swamp pond has a miniature dam with some extra filter media behind and below it, to help keep mud from migrating out of the swamp into the main fish pond. So far there’s been a little mud slipping through, but it clears up fairly quickly. I imagine we’ll have to clean things out and relocate the dirt periodically. 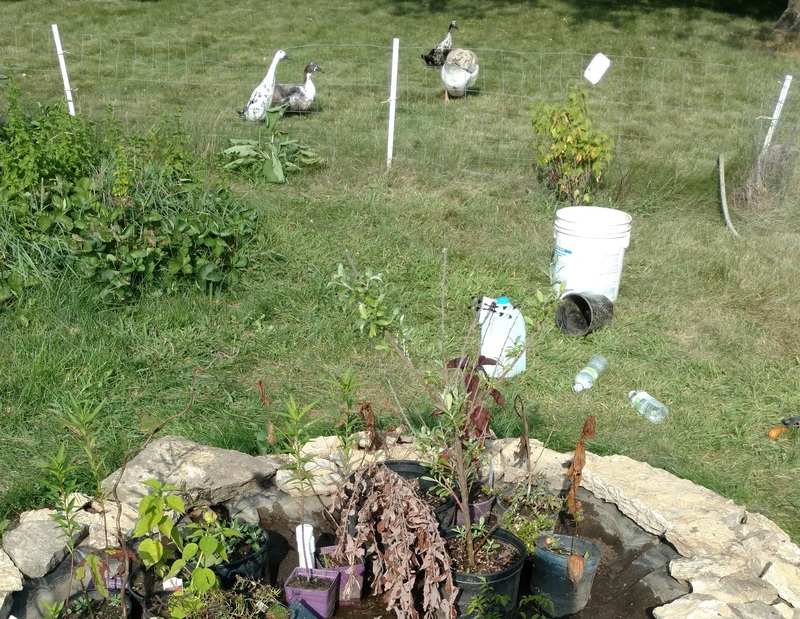 As I’ve probably mentioned in other posts, we have some pet waterfowl (ducks and a goose). While they’ve been quite interested in the process of digging this pond, we’re not planning to let them use it. 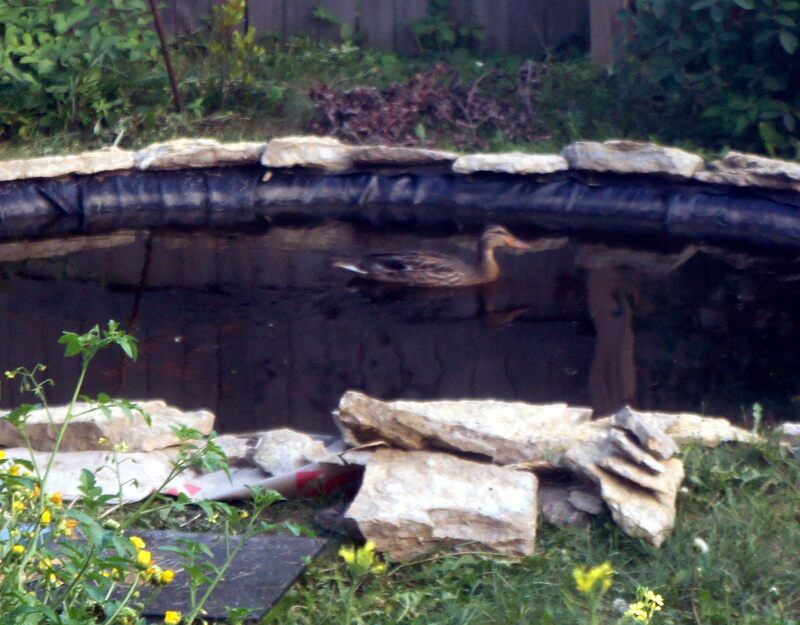 Ducks are just too messy and destructive for a small fish pond like this. They rapidly pollute the water, tear at the liner and plants, eat the fish, and drill holes everywhere with their beaks in search of bugs. 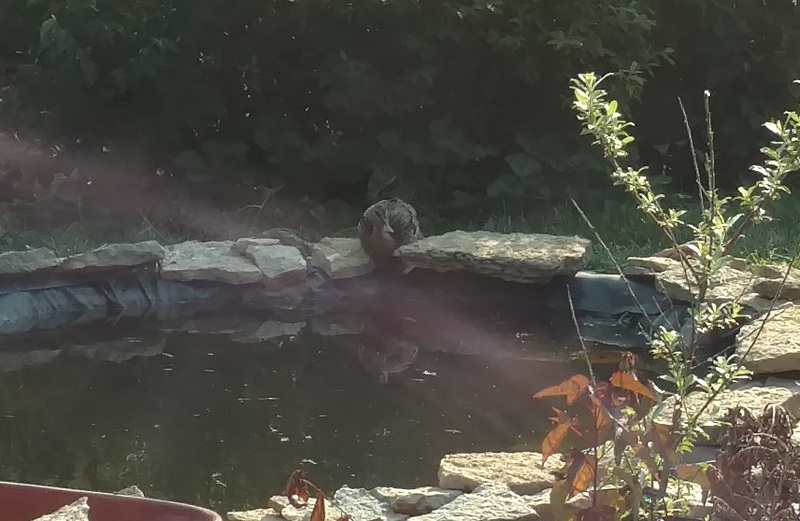 Our birds have their own private pond with an oversized filter, which I’ll detail in another thread. Apparently the local wildlife hasn’t heard about this “duck-free” idea, as we’ve already had a wild mallard hen land in the garden for a swim! In the next update we’ll try to make this hole in the ground look prettier and add some actual fish! This entry was posted on Tuesday, August 21st, 2018 at 12:12 pm and is filed under Uncategorized. You can follow any responses to this entry through the RSS 2.0 feed. You can leave a response, or trackback from your own site. Gabe, that is a super construct and required a lot of work. Good show! Good job Gabe, my only problem is the duck, good luck keeping it out.